Vignerons wines, our burgundies are just that at several levels. Winemakers wines, our burgundies are just that at several levels. We are proud of the choice parcels which give birth to the wines and to promote this mosaic of terroirs. We are also proud to be able to offer wine lovers wines, which we winemakers appreciate especially with meals among friends, accompanying simple and convivial cuisine. Our taste buds are roused by the idea of traditional harvest snacks when everyone gathers together, sharing parsley ham and goat cheese paired with our White Burgundy. The beautiful Chardonnay grapes, the essence of our white Burgundy, ripen on two terroirs situated in the commune of Marsannay: In Auvonne and in Varangée. Well drained and enjoying good exposures, the two vineyards with similar, silty, clay and limestone soil, contain many small stones on the surface which release stored energy. 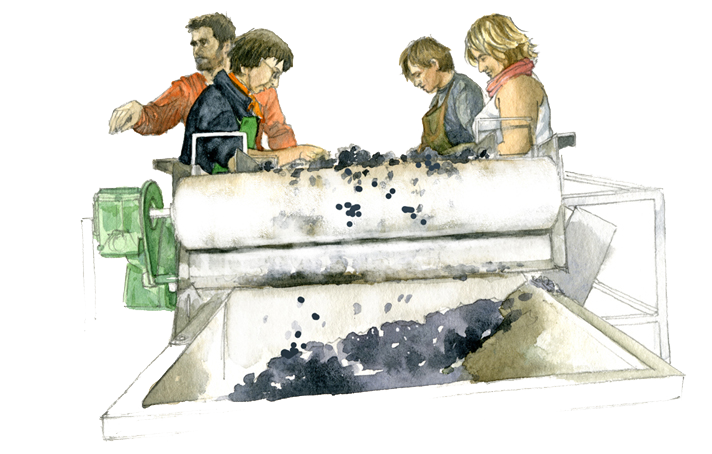 From this wine, we too derive the energy to carry out our duties and cut the grapes! A little bit later, when the sun has reached its zenith and hunger gnaws our stomachs, we take pleasure in uncorking a bottle of Passetoutgrains. 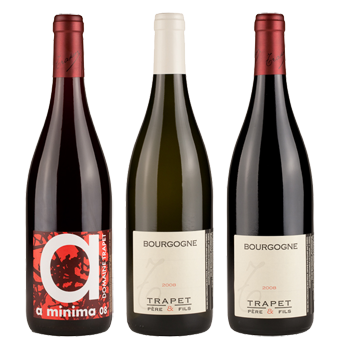 Wine of pleasure, wine of thirst, Passetoutgrains is the fruit of the tumultuous union between the vigorous Gamay grape and the subtle, high quality and delicate Pinot Noir grape. At the domaine these two plants plunge their roots into the parcel of Grand Champs. Located on the outskirts of Gevrey, this terroir replanted by Louis and Jean Trapet in 1965, belongs to the AOC of Gevrey-Chambertin. Vigneron’s wine, our burgundies intrinsically bear the competence of each one, the pride of great workmanship and the most beautiful expression of the terroirs possible.